Guyana’s Police Commissioner, David Ramnaraine on Monday justified the killing of three suspected bandits on the Georgetown seawall road although only two of them were armed and one gun was recovered. “The specific details can always be debated but at the end of the day the evidence is there that they were part of a criminal enterprise so whatever specific actions they might have played on the day in question; it is inescapable they were part and parcel of an arrangement to commit a criminal act with some serious consequences and I am happy that that has been averted,” the acting top cop told reporters. Kwame Assanah, Dextroy “Dutty” Cordis of Grove, East Bank Demerara and 57-year old Errol “Dynamite” Adams were shot dead on March 15, 2018 by police. Dispelling concerns by sections of the public that the trio was executed, the Police Commissioner assured that “no police officer sets out to execute a citizen” based on training and capacity building in recent years. He said the police, who were part of last week’s operation, have “superior firearms training than the average policemen”. “The policemen acted in keeping with the law. They were fired upon and, as law enforcement officers who are authorised to use deadly force as long as the deadly force is justified, as long as the deadly force is legitimate, to defend themselves. Were those policemen who found themselves in that situation expendable? Come on, let’s be real,” he said. Concerning the shooting death of Assanah, although he never had any brushes with the law, the Police Commissioner said that did not mean that that man was not involved in criminal activity. “Did we plant him with the other two who met their demise? Did we put him there? No one has disputed that he was there,” he said. Ramnarine said the police did not use a decoy, but that the intended robbery victim was indeed a customer of Scotia Bank, Robb Street who had moments earlier left that financial institution. At the same time, he said the entire operation to intercept and capture the suspects, who had “intended to use deadly force,” was fortuitously shifted away from the busy Robb Street area to the Georgetown Seawall Public Road. 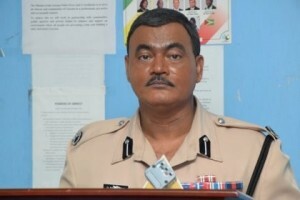 “I want to tell the citizens of this country, if the Guyana Police Force had not taken that course of action a few days ago and that would have happened there, a lot of collateral damage would have happened on Robb Street based on the information that we received and it is good that it ended up at the seawall at a more desolate location,” he said, adding that it was not the first time that persons have left the bank, went to the seawall area and were robbed. The Police Commissioner credited the operation to break up the bank-related robberies and carjackings to intensified surveillance, information, intelligence and public trust and support. “We have been able to put a dent to what was seemingly being referred to, regarded as by several persons out there as gang that was operating and was intended to create more havoc, more mayhem,” he said.